People walk amongst tents erected at the Idomeni refugee camp on the Greek Macedonia border on March 11, 2016, in Idomeni, Greece. Greek officials worked to clear an overcrowded makeshift refugee camp on Friday as European leaders met to discuss the border crisis that has left thousands stranded there in desperate conditions, NBC News reported. 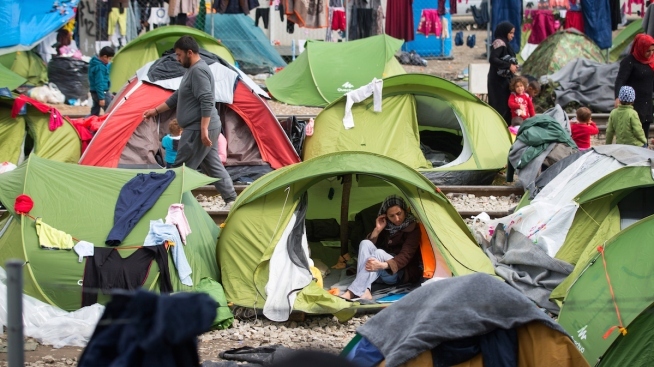 Nikos Toskas, Greece's deputy minister for public order, said the 14,000 migrants camped out at the border near the village of Idomeni were being persuaded to relocate to nearby government-built shelters. Toskas said Greece cannot use tear gas to move them because "half the people there are women and children." Macedonia closed its borders to all migrants and refugees this week — joining several Balkan countries in adding border restrictions after European Union leaders agreed Monday to close the Balkans route.